Canadian Bobsleigher Almost Killed By "Wood In His Buttock"
Chris Spring, an Australian bobsleigher who currently pilots a four man crew for Canada, was recently involved in a nasty crash while training in Germany for the World Cup. Three of the four men were airlifted to the hospital after careening into a crash barrier due, it is believed, to a steering error. Spring, who was puctured in the buttocks by a rogue piece of wood, was also involved in a crash while training at the Winter Olympics at Whistler. The crash left two others with severe bruising and severe leg injuries, but Spring took the worst of it. His buttock was apparently impaled by a piece of wood from the crash barrier used to prevent out of control sleighs from exiting the track. 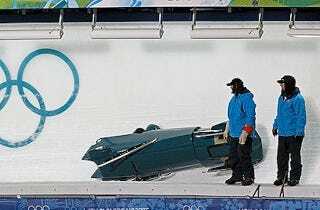 "[R]eports from the Canadian coaching staff were that the sled, probably travelling at about 120 kilometres an hour, rode up and bounced back down, then went up a second time and clipped the roll-over barricade at the top of the curve." Somewhere along the line, the shank of wood was lodged in his buttock, causing Spring to lose a lot of blood. So much so that he nearly died. It is possible that fiberglass portions from the sleigh also contributed to his injuries. This particular course, in the German state of Saxony, is said to be one of the most difficult bobsleigh tracks in the world and that's before taking into account the wood-in-buttocks factor. According to Don Wilson, the CEO of Bobsleigh Canada (real job) "[a]ll the athletes are resting comfortably" and "there are no life-threatening injuries." So, we should all feel free to poke fun with a clear conscience.